You guys I’m obsessed with this birdie fabric from Joann.com! But here’s the story: I had to ship my order of the Simplicity 8655 pattern to a US address then have it shipped to me in Barbados, then pay freight and customs fees. The fabric was on sale for about USD$7.00 a yard and I only got 2 yards. By the time the fabric got to me I paid BBD$30.00 a yard so I paid 60.00 in my currency for this fabric. I had never spent this much for fabric so I was afraid to cut into it. I didn’t know which pattern to use so I did an Instagram poll and you guys voted for Simplicity 8655. I am so happy with the choice you guys made! I mean yahl came through for a sister! I think this fabric and pattern are a perfect match. It’s my last summer make and surely my favourite summer make! I feel like it’s a very versatile top. I styled it both with jeans and a swimsuit! From Mimi G Style comes these Misses’ high-waisted pants with optional slim or bell bottom. The Simplicity 8655 Pattern also includes a summer-ready tie front blouse. 6-14. I made a 10. It looked pretty much exactly like Mimi’s. The instructions were very easy to follow, especially since I used the YouTube sewalong. So versatile. So flowy and breezy. Perfect for my Caribbean weather. I omitted the sleeve attachment. I found that they sat just a bit weird on my arms so I decided to leave them off. Would sew this a trillion more times. I thought I couldn’t rock it like Mimi but I surprised myself. I think I rocked the hell out of it with the swimsuit! *pats self on back* I ended up really loving this top, and so did my friends and family. I got so many compliments, I think this has to be my best make yet! Which look do you guys prefer? Let me know in the comments below! Yup! My local fabric store does not have a wide selection of fabrics so I have no choice but to go through that horrible ordering process ever so often. I really do not regret going through it for this fabric though. I really enjoyed making this top. 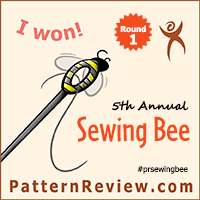 My advice – go buy that pattern girl!